Headaches are a pain in the neck – literally. An article released in The News-Press, estimates that 20% of chronic headache conditions are caused by problems in the neck. The article was written by a physical therapist who went on to describe how something such as bad posture could pinch nerves in the neck and result in a headache. Poor posture is more damaging than it may seem. Headaches are just one of the problems that can develop from poor posture. Herniated discs, scoliosis, and even the poor function of your internal organs can sometimes be attributed to poor posture. 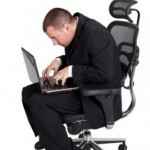 Listed below are some suggestions for improving your posture at work and at home. Get the right size desk and chair. Having a chair and desk that do not fit you can make it difficult to keep good posture even if you wanted to. Your feet should rest flat on the floor with your knees at roughly a 90-degree angle. Your monitor should be eye level and your keyboard should be approximately waist level. If you like to recline or lie down while watching TV, make sure your head is properly supported. Keeping your head too far forward or back, or having it tilted to the side (like when you put your head on an armrest), can cause neck pain. When standing, stand tall while pulling your shoulders back slightly and supporting your torso with your abdominal muscles. If practicing good posture is not alleviating your neck aches or headaches, you might have a deeper issue that needs to be seen by a professional. Things like poor posture, trips and falls, and sports injuries can cause the uppermost vertebrae of the spine to move out of place. When this happens, nerves can be pinched, muscles become tense in an attempt to support the weakened area, and headaches can develop. Here at Advanced Spinal Care, in Redwood City, California, we do a careful analysis of each patient’s situation to see if upper cervical chiropractic care could be beneficial for them. If we detect a misalignment in the upper cervical vertebrae, we use a gentle technique to move the bones back to their correct alignment. Many patients experience great relief from their headaches and neck aches after receiving our care.